Can the reading public imagine a less likely but more needed book than Stories for Men - a seventy-five-year- old anthology edited by Charles Grayson - written in an age when such a title would scarcely raise an eyebrow! Imagine a book about men in which the featured theme is not rapists, child abusers, or men who never weep, feel little sorrow, or prefer dog fighting to baseball.To say the least, this is a counter-cultural collective portrait necessary in today's politically correct world. The original editor, Charles Grayson, hit the nail on the head in his ""explicit"" opening remarks. ""The only claim we make for this book is that it doesn't pretend to offer the best, or the finest, in the world's foremost short stories by contemporary masters. Simply it is just a bundle of yarns by present day American writers, each dealing with a different phase of the actions and activities of men, designed for good reading."" 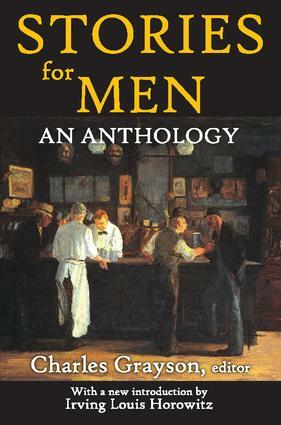 The text fulfills its mission.The work features little known short stories by such major writers as Erskine Caldwell on racial relations, James M. Cain on murder, James T. Farrell on street life, Dashiell Hammett on men and divorce, Ring W. Lardner on baseball, Damon Runyon on football, William Saroyan on horseracing, Thomas Wolfe on travel, William Faulkner on foreigners, among many others. For readers interested in a slice of America, this will be a book of inestimable value as well as personal pleasure. Stories for Men will prove ideal.